Shyamaji Krishna Varma was born on 4th October, 1857 in Mandvi, a province in Kutch, Gujarat. He was the son of Karsan Bhanushali, a laborer for Cotton Press Company and Gomatibai, his mother who died when Shyamaji was only eleven years old. Shyamji Krishna Varma was then raised by his grandmother. He had his primary education in the village school at Mandvi and thereafter completed his secondary education in Bhuj. He went to Mumbai for further education at Wilson High School where he learnt Sanskrit. Here in Mumbai, he acquired the knowledge of Sanskrit language in great depth from Shashtri Vishvanath and mastered the language. In 1875 Shyamaji Krishna Varma got married to a daughter of a wealthy businessman. Her name was Bhanumati and hailed from the Bhatia community. He in contact with Swami Dayananda Saraswati, who was a nationalist, a radical reformer and an exponent of Vedas. Swami Dayanand Saraswati was the founder of Arya Samaj. Shyamji Krishna Varma became his disciple and was soon found conducting lectures on Vedic Philosophy and Religion. 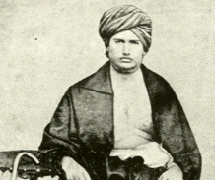 In 1877, Shyamji toured all over India propagating the philosophy of Vedas. These tours secured him a great public recognition all over India and many prominent scholars admired him for his knowledge and speeches. Such great was the influence of Swami Dayanand Saraswati on his life that his work was being remarked and applauded by all. He soon moved forward to became the first President of Bombay Arya Samaj. He became the first non-Brahmin to receive the prestigious title of "Pandit" by the Pandits of Kashi. He came to the attention of Professor Monier Williams, an Oxford Professor of Sanskrit who offered Shyamaji a job as his assistant. On 25th April, 1879, Shyamji arrived in England and joined Balliol College, Oxford with the recommendation of Professor Monier Williams as an assistant professor in Sanskrit. In 1881 he was sent by the Secretary of State for India to represent the learning of his country at Berlin Congress of Orientalists. There he not only read his own paper on the subject of "Sanskrit as a Living Language of India", but also he read and translated a patriotic Sanskrit poem sent by RamDas Sena, a learned Zamindar of Behrampur. It is believed that this recital of patriotic poem might have created the spark of patriotism in Shyamji Krishna Varma. In 1883, he cleared his B.A. and presented a lecture on The Origin of Writing in India to the Royal Asiatic Society. The presentation was very well received and as a consequence he was elected a non-resident member of the society. In 1885 he returned to India, enrolled himself as an advocate of Bombay High Court and started his practice. He later moved on and served for a short time as Diwan of Ratlam. His ill health made him retire early from this post with some gratuity for his service - which he invested in to cotton press mills to earn assured income. After a short period of stay in Bombay (now Mumbai), he settled in Ajmer which was also the headquarters of his Guru, Swami Dayanand Saraswati. He started practicing at the British Court in Ajmer and earned his fame as an advocate. During his stay here, he became a member of the Municipality of Ajmer city, and also served as Diwan of Ajmer. He also served the Maharaja of Udaipur as a council member from 1893 to 1895 followed by the position of Diwan of Junagadh State. Somewhere in 1897, a bitter experience with a British agent shook his faith in the British rule. He was moved to dedicate the rest of his life to fight the British rule.